Emily Borghard, GSS ’17, takes the idea of volunteering very seriously. “At some point, I called up my mom and said, ‘There’s got to be a way to pay it forward as a job,’” she said. After some research, Borghard found her calling in social work and then found Fordham’s Graduate School of Social Service. She earned her master’s in social work last year, and today she works as a clinician serving domestic violence survivors. 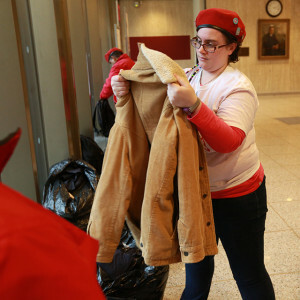 Borghard inspects a donated jacket. Several years back, Borghard was in need of help herself. She was in a car accident while in high school, and she experienced repeated seizures and short-term memory loss. Eventually, she underwent brain surgery to install a NeuroPace, which she described as a “pacemaker for the brain.” All the while, her parents, classmates, high school teachers, and college professors helped see her through her recovery. To her mind they paid it forward; now it was her turn. Much to the consternation of her neurologist, Borghard traveled overseas through an exchange program to teach inner city students on the outskirts of Marseille, France. “I said, ‘Isn’t this what the [neurological]device is supposed to be used for? I’m going to live my life and make a difference,’” she said. Although a few of her friends were concerned about her safety, she said that as a trained social worker she understands how to mitigate risk. Plus, it doesn’t hurt to be a member of the Guardian Angels. “They’ve got my back,” she said, adding the same was true of her Fordham professors. Sophomore Cat Fernando, right, and the Guardian Angels joined the donation effort. On Feb. 10, several Guardian Angels and a few Fordham folks joined Borghard for a clothing drive at Fordham’s Lincoln Center campus. The group collected gloves, hats, coats, and toiletries. To organize the event, Borghard teamed up with FCLC sophomore Cat Fernando, who distributes socks to the homeless. Although she says she doesn’t volunteer to make herself feel good, Borghard recalled a moment of giving that warmed her heart. She recently lost her father to cancer. Her mother suggested that she distribute her father’s clothes among the homeless men that she’d come to know by name. She gave one man her father’s sweater, and it put a big smile on his face. Borghard wishes that everyone could share in the volunteer experience. It would change perceptions, she said.